While many fans of luxury timepieces regard them rightly as works of art, others like them as fashion accessories. There’s room for both in this world and there are plenty of companies that can accommodate both groups. 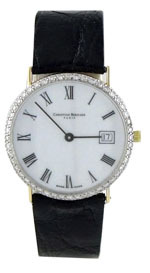 For those who favor the fashion angle, Christian Bernard watches are certainly worth considering. The French fashion company makes timepieces that are attractive, loaded with bling and surprisingly well made. The company is relatively new, having been founded in 1976, so they really don’t have much of a track record when it comes to selling timepieces. Still, they make an attractive, well-built timepiece that’s worth checking out. Read on for our full Christian Bernard watches review. The build quality of Christian Bernard watches is good. They use stainless steel cases and some models have gold. Sapphire crystal protects the watch faces. Water resistance is good, and many models are rated to 50 meters or better. Crowns are push-pull; we haven’t seen any in the product line with the screw-down variety. These are solid timepieces that should run well for years with proper care. It appears that the current line of models feature quartz movements exclusively. While the company is based in France, the watches and movements are made in Switzerland. Quartz offers high reliability and accuracy, and requires less in the way of maintenance than mechanical or automatic movements. As Christian Bernard watches are the product of a fashion company, rather than a company that specializes in watchmaking, you’ll find little in the way of innovations in the product line. These are timepieces that are sold as fashion accessories, rather than cutting edge examples of watchmaking. These watches feature tried and true technology, but you’re not going to find anything groundbreaking in their models. Here you’ll find lots of bling. If you like Swarovski crystals, or even genuine diamonds and lots of gold, you’ll be right at home with this brand. These are timepieces to be worn for elegant evenings on the town, or perhaps for a big business meeting. You likely won’t find them particularly suitable for casual wear, as they’re a bit formal for that. Displays are all analog, and a few models have a date function. Colors favor silver and gold, and the men’s models are styled not all that differently from the ladies’ models. This brand is ideal great for people who like their watches on the shiny side. The care and maintenance should be minimal, as all of their models feature highly reliable quartz electronic movements. You will need to have the battery replaced every two years or so and that would be a great time to have the water resistance checked, as well. You should store your watch in a cool, dry place and keep them away from strong magnetic fields or extremes of temperature, as either of these can affect the performance of the unit. With proper care, your watches should run well for a long time. We can’t find any information about the official warranty, probably because the brand is sold officially through authorized retailers and even the company’s own Website has no information online about their watch line. If we had to guess, we’d say that the warranty is probably for two years from the date of purchase, as that’s the warranty offered by more than 90% of all watchmakers out there. 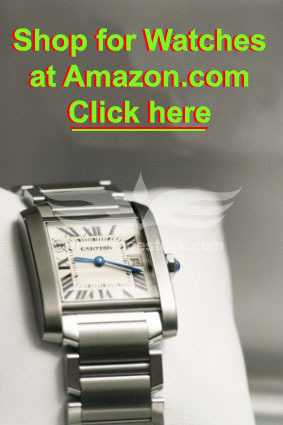 Watches purchased online or from third party vendors usually come with a warranty from the retailer itself. As luxury watches go, you’ll find that prices range from moderate to expensive. List prices range from about $595 on the low end to about $3000 on the high end, though we’ve occasionally seen models priced a bit higher. Collectors aren’t yet showing much interest in the brand, probably because they’re only about 40 years old and feature quartz movements. This may change in time, but for now, you should not expect these watches to appreciate in value over time. Still, they’re not exorbitantly expensive as luxury timepieces go and they’ll certainly look terrific with any evening wear. Officially, you can find the brand for sale only at authorized retailers, which are mostly company-owned stores in Europe. Unofficially, you can find them for sale at a few Internet retailers, though they’re represented by fewer sellers than other fashion brands. Still, Internet retailers are your best bet for finding the brand at all, and certainly your best opportunity to buy at a discount. We’ve seen some retailers offering the brand for sale at prices up to 83% off of the suggested list price, making them a relative bargain. Given the steep discounts that are available for the brand, if you can find them, it’s well worth taking some time to look online. This brand somewhat of a mystery. The company is fairly well known, but not widely distributed. They’re sort of a secret in the industry, it would appear. While the watches are certainly attractive and offer lots of eye appeal, they’re relatively low on innovation and features. On the other hand, they’re quite well built and offer attractive pricing, especially if you can find them online at a steep discount. Wider distribution would probably help the brand and over time, they’ll probably expand their list of authorized sellers to include some stores in North America. All that aside, these watches are attractive, well made and available at good prices. 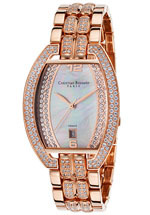 If you like your watches with lots of bling, stones, gold, and shine, then Christian Bernard watches are probably worth taking the time to find.